Colombia’s President Juan Manuel Santos was awarded the Nobel Peace Prize on Friday for his efforts to broker an end to more than a half-century of civil war – the Western Hemisphere’s longest-running conflict. “I’m so honored and so grateful…this is a very important event for my country, for the victims of this war and this is a commitment to keep trying to bring peace to my country,” Santos told the director of the Norwegian Institute in Oslo when he called to tell him the news. “This honor is not mine, but rather for all the victims of the conflict. Together we will win the most important prize of all: PEACE,” the Colombian president later tweeted in Spanish. Santos’ efforts culminated in a peace deal this year between the Colombian government and leftist guerrillas of the Revolutionary Armed Forces of Colombia, or FARC. Santos’ work, however, has until now amounted to little more than attempts that have been frustrated by disappointment and setbacks. 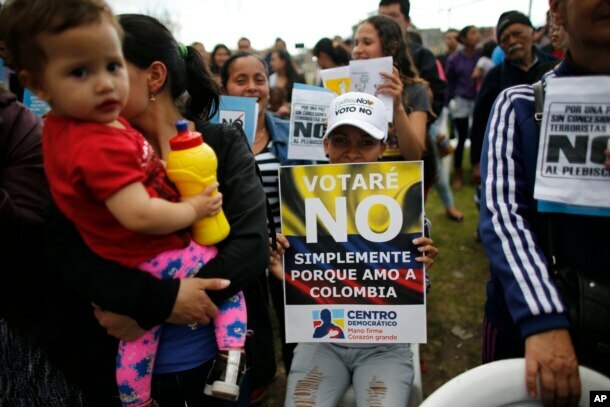 Colombians rejected the deal in a recent vote – a reflection of anger among many who objected to giving amnesty and political power to rebels who for decades terrorized Colombians from bases deep in the country’s forests. The rebels, whose activities were funded by drug trafficking and kidnapping, committed to laying down their weapons and pursuing peace, accomplishments that were sufficient for the Norwegian Nobel Committee to recognize Santos’ role. A statement read Friday in Oslo by Kaci Kullmann Five, chair of the Norwegian Nobel committee, said Santos won the award for “his resolute efforts to bring the country’s more than 50-year long civil war to an end. The war has cost the lives of at least 220,000 Colombians and displaced close to 6 million people. The conflict began in the mid 1960’s, when the guerrillas founded the FARC and declared their intention to topple Colombia’s government and replace it with a Marxist regime. The group amassed a large fortune through drug trafficking and ransoms from kidnappings, but it lost ground in the 1990’s and early 2000’s as the Colombian leadership boosted its offensive against the guerrillas – largely with the assistance of the U.S. government. In recent years, the guerrillas made concessions for peace that included giving up their practice of kidnapping for ransom. It included a cease-fire, the handing over of weapons, and security guarantees. The agreement, however, also provided for “transitional justice” or amnesty and granted the rebels 10 seats in the Colombian Congress – provisions that are controversial among citizens who have not forgotten abuses they endured during the guerrillas’ campaign of bombings, kidnappings, murders and abduction of child soldiers. Opponents to the peace deal signed between the Colombia government and rebels of the Revolutionary Armed Forces of Colombia, FARC, attend an event to promote the “No” vote in the upcoming referendum in Bogota, Colombia, Oct 1, 2016. In an October 2 referendum, voters narrowly rejected the deal. In announcing the award Friday, the Norwegian Nobel committee did not ignore the suffering that the war has caused ordinary Colombians, or the difficulties they have confronted to win peace. “The award should also be seen as a tribute to the Colombian people who despite great hardships and abuses have not given up hope of a just peace and to all the parties who have contributed to this peace process,” said Kullmann Five. Santos said Friday Colombia is “very, very close” to ending the war and he said the Nobel Peace prize will serve as a “great stimulus” to reach that end. “I receive this award in their name — the Colombian people who have suffered so much, and especially the millions of victims that have suffered with this war that we are on the verge of ending,” he said in a telephone conversation with officials of the Nobel foundation. In the end, it is his determination in the face of adversity that won Santos the prize. Nobel committee officials recognized what they said is a “real danger” that the peace process will come to a halt and the civil war will flare up again. “This makes it even more important that the parties headed by President Santos and the FARC guerrilla leader Rodrigo Londono continue to respect the cease-fire,” the committee chair said. FARC guerrillas were not included in the prize. Still, Londono congratulated the Colombian president in a tweet Friday.